Around here we’ve been having some night time troubles. The whole nappy-less nights was Oscar’s idea and we had a couple of weeks of about half way sucessful, but he seems to have lost interest in trying. Aparently it’s just easier to stay in bed than getting up and going to the bathroom! 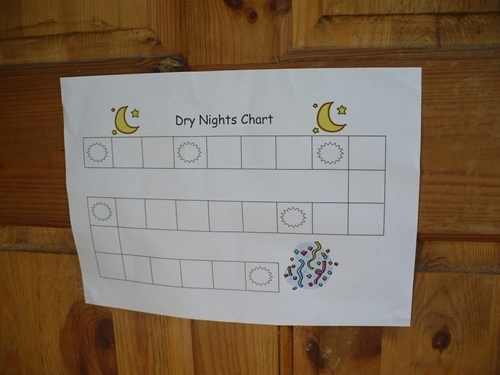 I’ve come up with a different idea (okay, bribe) to see if we can conquer night time dryness. We have installed this chart on the bathroom door. The plan is that every time we have a dry night we’ll put on a sticker. Anytime the sticker lands on a star there will be a reward. As you can see the gaps between the rewards get bigger as we go along. 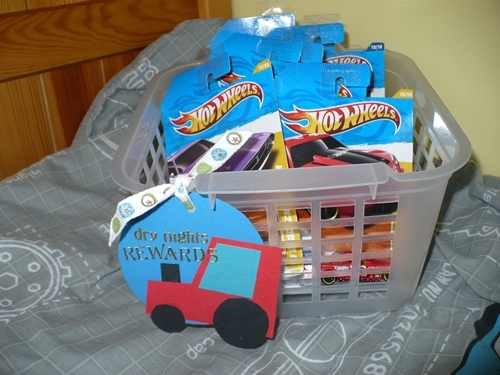 We’ve had a trip to Sainsbury’s and bought some exciting looking rewards. Will let you know how we get on.